These Cookies and Cream Oreo Cupcakes are a moist vanilla cupcake stuffed with Oreo cookies and topped with an Oreo buttercream frosting. This is the ultimate Oreo cupcake made from scratch. Rarely do I come across someone who doesn’t like Oreos, would you agree with me? In my pantry, I have a couple of shelves (okay more than a couple) that are for blogging ingredients. Inevitably, there’s at least a few bags of Oreos at any given time. Recently, my husband was taking a break from his strict diet after the wedding and he definitely took down a package of Oreos in two days. He asked me if he could have some, and I said sure. Then it came time for me to make these cupcakes and I was all, “what happened to my Oreos”? His response, “Oh, I owe you a bag”. Insert eye roll here. I can’t complain though because he is SO good, he hardly ever eats sweets. I am not sure how he lives with me. His resistance is so strong that he didn’t even eat one of these Cookies and Cream Oreo Cupcakes even though he really wanted one. I have to say, even I was surprised by this. 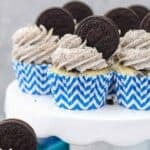 These Oreo Cupcakes are a moist vanilla cupcake stuffed with Oreo cookies and topped with an Oreo buttercream frosting. 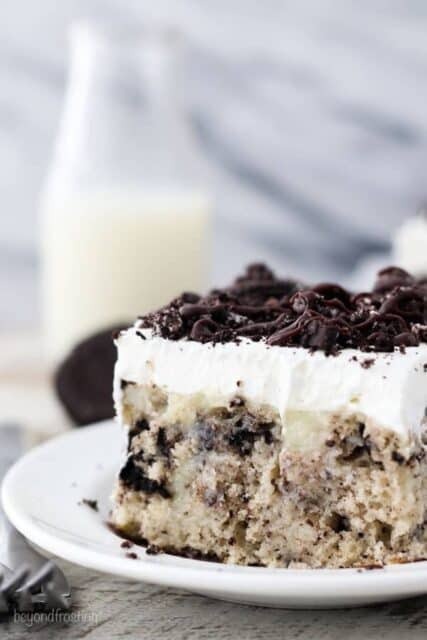 Cookies and Cream never tasted so good! The base of this cupcake is from my moist vanilla cake recipe. 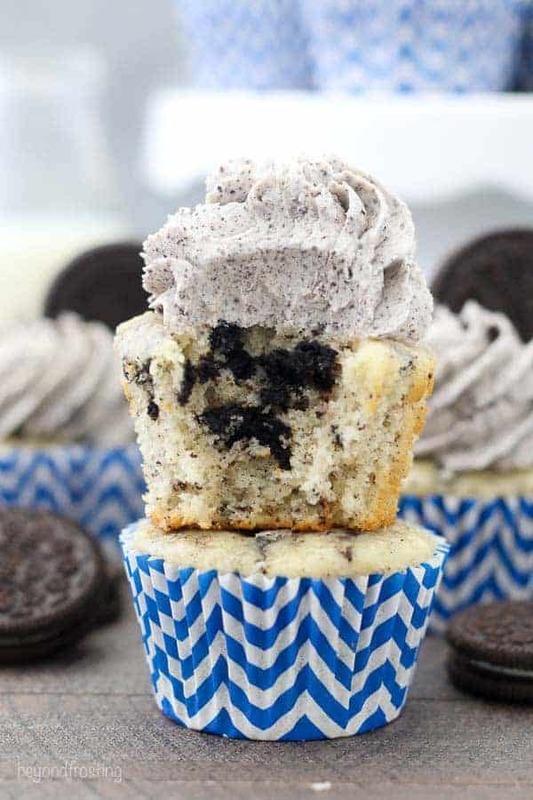 The cupcake batter is quite thin, so when you’re scooping the batter into the cupcake pan, try to get an even balance between the batter and the Oreos. This is one recipe where you do not want to overfill the cupcake pan. Since there are chunks of cookies in the batter, you will end up with an oddly shaped dome on top of your cupcakes. You’re probably also going to end up with more than 24 cupcakes for this batch since the overall volume of the batter is higher. For the Oreo frosting, we are making a batch of my perfect vanilla frosting and adding some crushed Oreos. For any amazing frosting recipe, you need some extra time beating that butter so it gets a nice whipped. It makes piping cupcakes so much easier. Just be patience in the process. 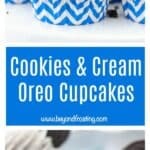 You’ll notice the Oreos in the cupcake are chunky whereas the Oreos in the frosting are crushed to a fine crumb. I usually use my food processor for this. The reason the frosting has the crushed Oreos is so that I can still pipe the frosting without any weird lumps. 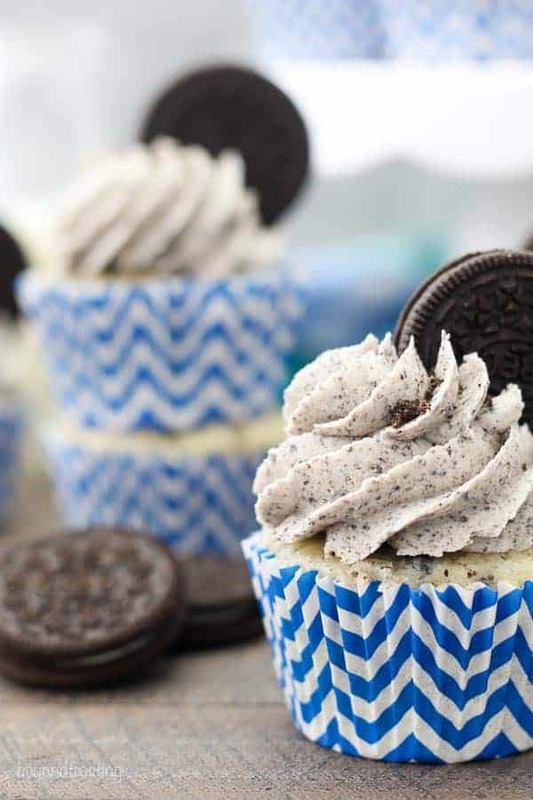 You can top of these Cookies and Cream Oreo Cupcakes any way you’d like. I stuck another Oreo in there, because you know, there’s never enough Oreos. It might also look nice with some drizzled chocolate. 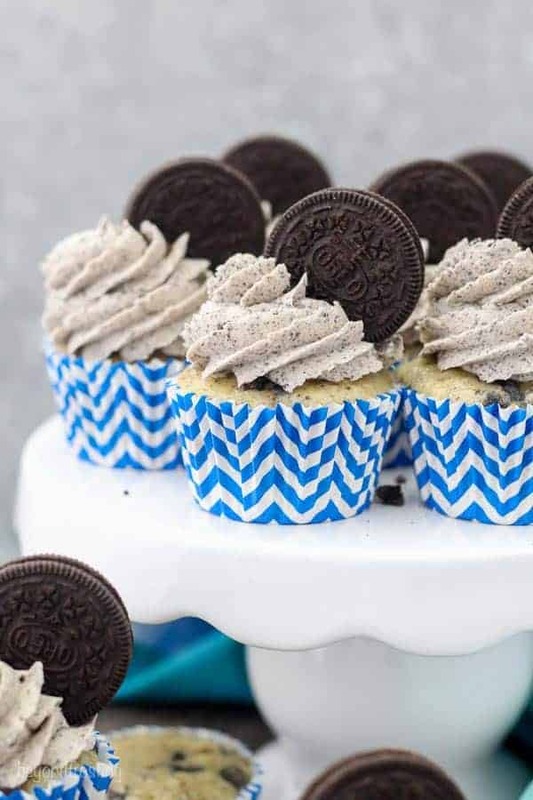 Everyone loves a good cupcake, but no one ever says no to Cookies and Cream Oreo Cupcakes! Add half the flour followed by the baking powder and salt and beat on low speed while pouring in half of the milk and mix just until the flour starts to incorporate. In a large Ziploc bag, crushed the Oreos into small pieces using a rolling pin or something similar. 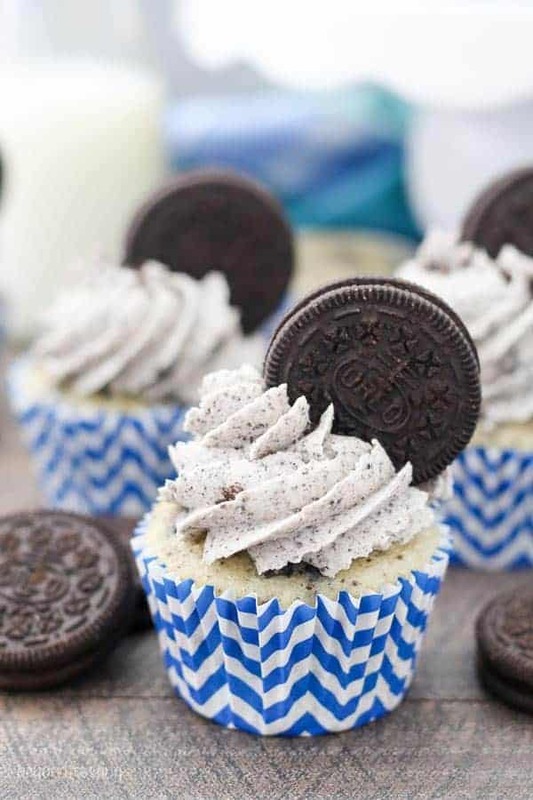 Fold the crushed Oreos into the cupcake batter. Bake at 350°F for 18-22 minutes. Test the cupcakes for doneness by inserting a toothpick into the center of the cupcake. If the toothpick comes out clean, the cupcakes are done. Cool Completely. For the frosting: Cut the butter into pieces. Using the paddle attachment, whip the butter for 3-4 minutes, scraping down the bowl occasionally. Beat the butter until it looks lighter in color. Slowly add the powdered sugar 2 cups at a time, mixing on low speed until it’s incorporated into the butter. Then increase the speed to high and beat for 30-60 seconds. Repeat until all your powdered sugar has been added. In a food processor, grind the Oreos into a fine crumb. 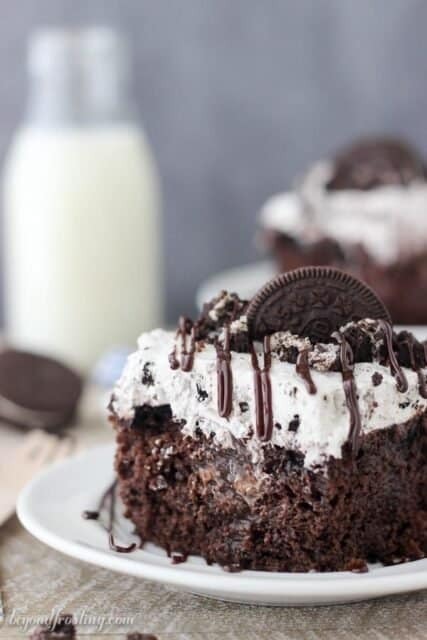 Add the crushed Oreos to the frosting along with the heavy whipping cream. Slowly beat the crumbs into the frosting then beat at a high speed for 60 seconds. 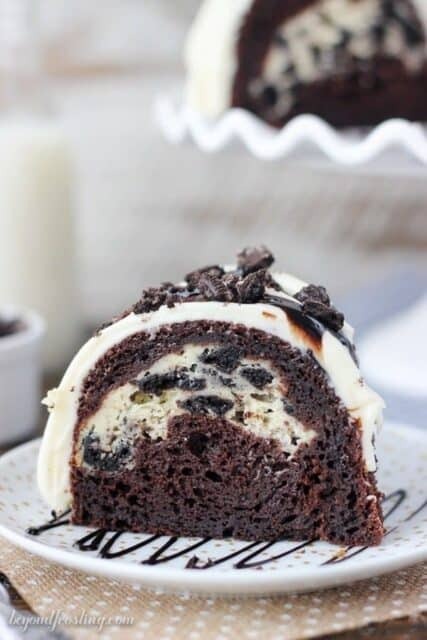 In a large piping bag fitted with a large closed star tip, pipe the frosting onto the cupcakes and place an Oreo in the side. Store in an air tight container. The Oreos in the cupcakes are roughly chopped. The Oreos in the filling should be fine crumbs if you want to pipe the frosting. 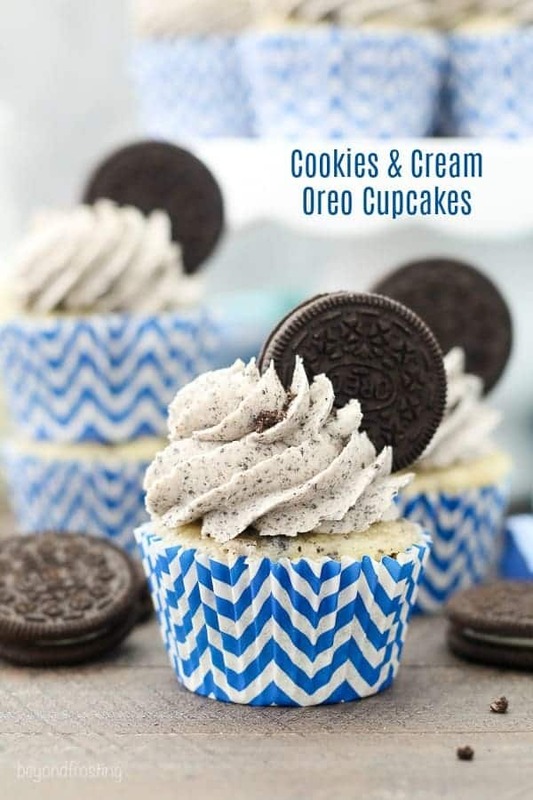 This is by far the BEST cookies n cream cupcake recipe! I made them just for fun and brought them to work. All my coworkers were over the moon saying they were the best cupcakes they ever had!!! Perfect combination with the cupcake and icing, not too sweet. Will be making these for my family at Easter. Thank you so so much Jessica!! These are the best cupcakes in the world. Thank you for the recipe!! You’re so welcome! Thank you for leaving a comment, I am so glad you loved them! We had a roller coaster getting these made for my niece’s birthday. The kind owner of this food blog not only understood my frustration when the recipe disappeared while we were in the middle of mixing it, she took the time and emailed me the recipe! It was perfectly timed! my niece loved helping me make these and they were the hit of the party! Thank you so much for your time to help make my now 11yr old niece’s birthday! You’re so welcome! Happy to help and sorry again for the headache with the website. I am so glad to hear your niece’s birthday still has these cupcakes!